To effectively build long-lasting ecosystems of interoperable, wirelessly powered devices, manufacturers need a global technology standard to follow. Real wireless power delivers energy without plugs, wires, or charging pads. It should power multiple devices in motion, without a line of sight, and at a distance. A global standard will bring this kind of technology to the masses quickly and efficiently. Read Ossia's press release here. Without a universal standard, we are holding ourselves back. Strength of innovation and application comes in numbers; many people and companies who work together can develop a useful and usable wireless ecosystem for everyone to use much faster than each of us in isolation. That’s why we have released the first global wireless power technology standard: Ossia’s Cota Standard 1.0. And it’s available now. It’s an exciting time. With the Cota Standard 1.0, original equipment manufacturers (OEMs) around the world can speak the same language when developing Cota Real Wireless Power products. Cota is real wireless power. No cables. No charging mats. No line-of-sight requirements. Cota is inherently safe and does not interfere with other wireless technologies. All Cota-enabled devices can be activated, managed, and monitored via the Cota Cloud platform. The standard shows how to make this work. Ossia’s Cota Standard 1.0 is another significant step in bringing the era of real wireless power to the here and now. 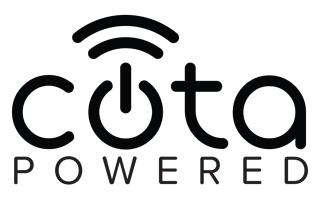 Anyone who has a Cota-enabled device can access wireless power at work, airports, hospitals, and other locations, with appropriate permissions. And any company that makes Cota-enabled security sensors will ensure that these sensors will safely charge in any location that has a Cota Power Transmitter, whether it’s an office building or data center, even over long distances. This standard is a strong foundation for companies to build a licensing business model and introduce wireless power globally. To learn more about the Cota Standard 1.0 and licensing opportunities, .